Anna of The Lawrence Girls and Daddy, has three crafty girls. The stories of their lives and interactions has me laughing almost every time I read her blog! In 2-3 weeks our little girl will arrive and I am both terrified and curious what life with three girls is like – curious, read her blog! Till then, Anna and her girls had a recent craft project – blowing bubbles and making art! What a great combination! We did bubble art last summer, but used cups. I know my kids would probably have preferred the true “bubble” method! Ready for some very messy, very fun bubbles turned painting project? Thanks Anna for a great guest post! 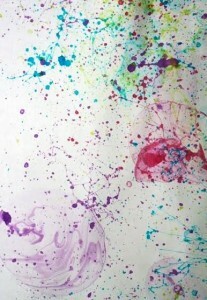 Grab 4 bottles of bubbles and food coloring. I was fortunate enough to satisfy my obsessive nature by matching my dye to the bottles. You don’t have to be so picky! 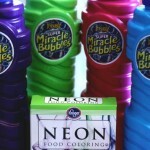 Open the bubbles and squirt half a bottle of coloring into each bubble container. I didn’t take this task outside. It’s messy, so you should go outside before you squirt food coloring all over your dining room table! Back to the bubble paint: take out the wands and change the kiddies into old clothes. The goal is to blow bubbles aimed at the paper, and when the bubble pops it leaves a great design. My kids thought it would be better to take the Jackson Pollock route. Looks like they had a blast! Thanks again, Lawrence Girls and Daddy Too for a fun craft idea! Awesome! Does the food coloring stain the skin? 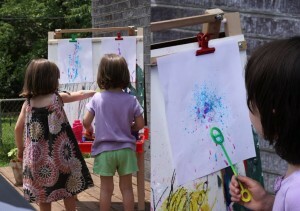 Great idea to move the easel outside! .-= The Activity Mom´s last blog ..1000 Readers Celebration Giveaway #5 =-. What fun! JDaniel has an easel. Outdoors sounds like the right place for this. What a great project! That looks so fun. .-= Christine´s last blog ..Getting the House Ready =-. .-= Blessing´s last blog ..3 Vitamins That You And Your Kids Need =-. Rachel, thanks again for sharing our craft! I hope you guys enjoy getting a little messy and creative, too. .-= Anna Lawrence´s last blog ..We’re home! =-.